I think I had dumped non-public pensions in my public pensions thread before, but now I think it's time for its own thread. In a move that has been called "malevolent," the owners of Major League Baseball have voted to allow themselves to cut pension plans for non-uniformed employees, according to ESPN's Adam Rubin. No team has made such a move at this point, but the fact that the possibility exists comes across as questionable to experts. Rubin specifically cites another source that sees Royals owner David Glass as likely to "reduce or eliminate employees' pension benefits." No current pension plans will be affected by the change, but future employees for MLB teams might not be in a position to receive pensions. Additionally, the players will not be affected at all. There are varying expert opinions on whether or not 401k plans are preferable to traditional pensions, however, the change is being met with a certain degree of initial dissatisfaction due to the fact that such a maneuver is typically executed by companies in he midst of "financial distress" -- which is clearly not a reasonable way to describe Major League Baseball. Teams saw record levels of revenue last season, and that trend is expected to continue as teams continue to sign massive new TV deals. The employees that the change could affect include secretaries, scouts, front-office executives, and minor league staff. I remember something like that being proposed for California. Not really about "public" plans but thought I would put here anyhow as is very very related. Why do I see this Theresa G's. name everywhere in the media when pension is the topic. . Why? The PBGC engineered a merger of Ottenberg pensions into another plan and Local 33 went under. Since 2005, the agency has paid about $722 million to people in similar failed plans. A coalition of 40 labor and employer groups, including Bechtel Group Inc., United Parcel Service Inc. (UPS) and -- at the time -- the International Brotherhood of Teamsters, last year said pension trustees should be allowed to cut benefits to current retirees. The once-unthinkable idea is now gaining support as funds falter and unemployment, student debt and longer life spans leave people less financially prepared for retirement. Others disagree. Giving pensions that option would make the problem worse, and not just for retirees, said Teresa Ghilarducci, an economist at The New School for Social Research in New York. Multiemployer payments are low and concentrated in economically distressed regions, including the industrial Midwest, she said. Once some pensions get the flexibility to cut benefits, others will want it, too, she said. It’s a slippery slope that could lead to changes at single-employer pensions, which have 30.4 million participants. The PBGC, created in 1974, is on uneasy financial footing itself. The agency charges companies in multiemployer plans an annual insurance premium of $12 per plan participant, less than one-fourth of what other pension plans pay. The agency projects 173 multiemployer plans will exhaust assets, costing it an estimated $10 billion and leading to the insurance program’s insolvency in 10 to 15 years. By the agency's own admission, PBGC will be insolvent in 10-15 years as its capital base dwindles.This means that the US government will be on the hook not just for the failing public plans such as the Social Security Trust Fund, but also for some private pensions as well. Though the total failing private pension liabilities are expected to be small relative to the massive public sector problem, PBGC anticipates to see some 173 pensions fail in the next decade or so. 1. Corporate pensions will need to pay higher premiums to PBGC. 2. Employees will need to contribute more to these plans on an ongoing basis. 3. Employees of bankrupt companies with underfunded pensions will need to take larger haircuts on their payouts. Not only do employers face a 52% increase by 2016 in the regulatory cost of administering their pension plans, but also a $150 billion surge in liabilities from longer-living retirees. The looming costs and growing liabilities are forcing many companies to consider ways to cut pension expenses, accelerating a decadeslong shift away from defined-benefit pensions plans—which guarantee a set payout for life—to plans that shift the burden of retirement savings to workers. As employers back away from lifetime commitments to their retirees, some labor negotiations are getting tense. "It's a big deal," said Caitlin Long, head of the corporate strategies group at Morgan Stanley. MS +0.51% "It's definitely causing companies to rethink the benefits of holding a pension." In 1979, 38% of U.S. private-sector workers were covered by such plans; by 2011, the most recent data available, the number had fallen to 14%, says the Employment Benefit Research Institute. By contrast, the percentage enrolled in defined-contribution plans, such as a 401(k), more than doubled to 42%. That means more employees are responsible for saving for their future. Congress intensified the financial pressures in December by raising the fees companies must pay the Pension Benefit Guaranty Corp. Fees to the federal pension insurer for each employee covered will rise to $64 by 2016, up from $42 last year. The Society of Actuaries recently updated its mortality tables for the first time since 2000 to reflect the longer life spans of today's retirees. Based on the update, the average man who turns 65 this year is expected to live to 86.6, up from 82.6 in 2000. Women are expected to live to 88.8, up from 85.2. That means companies will have to sock away more money to pay benefits years longer. The new tables will be finalized later this year and become the standard auditors use to gauge corporate pension obligations. Mercer LLC estimates that corporate pension liabilities totaled about $2 trillion at the end of 2013. The increased life expectancy will add about 7% to the pension obligations on balance sheets, according to consulting firm Aon Hewitt. "It's another reason to say, 'Why do people have these plans?' " said Wayne DeVeydt, chief financial officer of WellPoint Inc. WLP +0.54% The health insurer has closed its defined-benefits plan to new employees, but the plan still covers roughly 3,000 workers. I've always been curious how pension and annuity costing mortality rates vary, although interest rates have come back down a bit lately, it seems the pension buy-out market could do well in the next few years. The U.S. Senate passed a bill on March 25 to exempt certain charity and cooperative pension plans from the Pension Protection Act of 2006. The Cooperative and Small Employer Charity Pension Flexibility Act (H.R. 4275) makes permanent an exemption that allows cooperative and small employer charity pension plans (CSEC plans) to avoid the minimum funding requirements imposed on private sector defined benefit plans. The House of Representatives had previously passed the bill on March 24. • Requires the Participant and Plan Sponsor Advocate established by ERISA to make itself available to assist CSEC plan sponsors and participants. Does anyone know if these plans are covered by PBGC? At what level? This could be seen by Congress as a free lunch, lower contributions, no consequences. When Congress passed the PPA, its focus was more on the health of the PBGC than on maintaining a robust defined benefit pension system. If every private sector pension plan were always fully funded, then the PBGC would never face another threat. But if every corporate pension plan were always fully funded, neither corporations nor pension recipients would gain the benefit of long-term investing that can reduce the cost of maintaining a pension. Such an onerous requirement will cause many companies to terminate their plans. It would be wonderful if all corporations' pensions were always fully funded. But imagine a healthy company that always maintains its pension at 80% funded. So long as that company is in operation and keeps its plan funded at that level, the investments can grow and the pension plan will always meet its obligations. That company poses little threat to the PBGC. 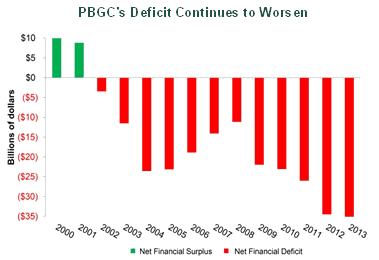 The threat to the PBCG does not come from underfunded pension plans. It comes from underfunded pension plans in companies that go bankrupt. By the time companies file for bankruptcy they have generally stopped funding their pensions anyway, regardless of legal requirements. In trying to protect the PBGC too much, Congress made maintain plans too difficult, expensive, and volatile, which is why so many have already closed.